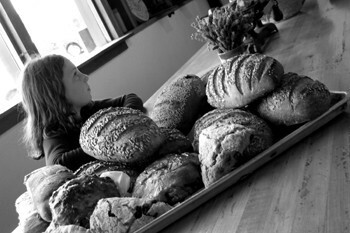 Loaves and Wishes: A young customer dreams over loaves at Freestone's Wild Flour Bakery. There's always a crowd in the morning. Bleary-eyed and hungry, we congregate around warm coffee and a newspaper, in pure joy as frosting dribbles down our fingers. Licking fingers is permitted among friends and the gossip is always fresh. Starting in Penngrove and winding our way around Sonoma, Napa and Marin, we gate-crash local coffee klatches and reveal the most soul-satisfying breads and pastries baking in the North Bay. Keith Giusto is a flour fanatic. He lives, breathes and dreams about the stuff, as you quickly realize when he starts talking passionately about his personal legion of wheat farmers. The photo album of his agricultural buddies only reinforces the notion that this is a man on a singular mission: to bake bread. Part-owner of one of the largest organic grain mills in the West (located in Logan, Utah), Giusto is totally invested in his bread, from the germination of specially selected wheat varieties to his 15-year-old Zinfandel grape sourdough starter. The third generation baker and flour producer recently broke with his South San Francisco family to start his own bread-baking company in Penngrove. Though Giusto says it was fairly amicable, he describes himself as an artist who couldn't worry more about the bottom line than he could about his beloved bread. Giusto bakes fresh loaves every morning using flours created to his exact specifications. But the loaf to covet is his crispy, crunchy sourdough, which won a James Beard Award in 1996--sort of like the Academy Award of food. Though Giusto also sells on Wednesday and Saturday at the Santa Rosa farmers market, his Penngrove bakery and deli offers Italian meats and sandwiches. Our favorite was a crunchy baguette of sourdough with imported olive oil, balsamic vinegar, fresh mozzarella and basil. Think you can bake like the pros? Giusto is glad to share his flour--just bring your own bag and prepare to be in the company of such devotees as Acme Breads, Amy's and Whole Foods. Full Circle Baking Company, 10151 Main St., Penngrove. 707.794.9445. Just down the road, Alexandra Davison recently opened her first bakery, which features only "sweet stuff," as she describes it. This is the place for special-order cakes--exotic flavors like the Scandinavian princess cake filled with raspberry, custard and whipped cream; a Moroccan pound cake with raisins, nuts and cinnamon; or a German bee sting cake with sugar and buttered almonds. Her cakes are mostly made to order, and she's always up for a challenge. Davison bakes up scones and sweet rolls herself each morning, and offers an international selection of afternoon tea menus by reservation. Ginger Bread Haus, 8274 Old Redwood Hwy., Cotati. 707.665.9068. A gigantic box of walnut croissants has been a staple at every family get-together since I was a teenager. The men folk wake up early, start a pot of coffee and hunt down a hefty dozen of these gut-busters, filled with chopped walnuts and gently glazed on top. These big, burly, buttery treats are just about as close to orgasmic as one might want to get at a family reunion. Cafe des Croissants, 101 Golf Course Drive, Rohnert Park. 707.585.6185. The little chocolate biskvie was calling my name. Unfortunately, the 10:45am coffee rush overwhelmed the staff and my biskvie--a chocolate and peanut butter confection demurely housed at the bottom of the pastry case--would have to wait. "Who invited all you people?" demanded the woman behind the counter, as the hungry crowd demanded gooey, buttery Danish pastries and hefty rye bread that could double as weight-training equipment. The heavily trafficked Village Bakery adds a touch of Scandinavia to spice up usually ho-hum cookies with exotic spices like cardamom, ginger and cinnamon. "These got me through two pregnancies," says one customer, looking longingly at the fruit-topped Danish and orange frosted buns. For those unable to wrap their tongues around a good smørrebrød, there are plenty of excellent sourdoughs and baguettes as well. In all the madness, I left with only a lemon-cornbread cookie and an ultimate macaroon, barely sating my hunger for the next seven miles. Village Bakery, 7225 Healdsburg Ave., Sebastopol. 707.829.8101. We've lauded the organic, brick-oven-baked praises of Wild Flour before, and we'll do it again. This off-the-beaten-path bakery turns out some of the heartiest and most flavorful breads in the North Bay, chock-full of cheese, herbs and fruit. Though the cinnamon sticky buns are among the most popular, we still love the fougasse. Just don't try to get any warm buns during the week. The oft-shuttered bakery only turns out warm loaves to the public Friday through Monday. Wild Flour Bread, 140 Bohemian Hwy., Freestone. 707.874.2938. Sitting outside Healdsburg's most popular bakery, the steam from my double latte escapes its cardboard cup and swirls into the air. Pulling a crispy rosemary pizzetta from a bag dotted with olive oil and savoring the salty, herbaceous round in my hand, I'm reminded why being a food writer is so damn great. And who can resist an old-fashioned screen door that slams shut as you step inside? Resist the temptation to yell, "Mom! I'm hoooooome." Downtown Bakery and Creamery, 308 Center St., Healdsburg. 707.431.2719. This little bakery is the hub of the town, serving up fresh, hot loaves from its brick ovens just about every morning. Locals swear it's the very best bread for miles as they sip their morning coffee and watch the world go by. Model Bakery, 1357 Main St., St. Helena. 707.963.9731. You've never tasted a Napoleon quite so fabulous: rich, creamy layers of caramel cream separate crunchy layers of nougaty wafer and whipped cream. Trying to eat this in the car was quite nearly fatal. Let out your inner Gaul while nibbling on a jambon buerre, a skinny baguette smeared with butter and stuffed with ham and Gruyère cheese. Owned by the famed chef Thomas Keller, this Yountville takeout may be the closest an average human gets to the Laundry. Bouchon Bakery, 6528 Washington St., Yountville. 707.944.BAKE. My favorites are not so much pies as tiny, adorable cakes. Just about three inches in diameter, these pocket-sized confections are so beautiful it seems a shame to eat them. I'm over it, though, as I munch through two. The best of the best: the marjolaine ($6.75 for the individual size), a pint-sized cake layered with chocolate-praline butter cream, pralines, chocolate mousse and a chocolate glaze. Sweetie Pies, 525 Main St., Napa. 707.257.8817. The line starts, oh, somewhere back near the door most mornings. Town so-and-so's congregate for the latest gossip, a cup of push and a morning pastry. Frankly, we find the conversation better than the sweet stuff here, but being seen at the scene is a Sonoma tradition. Basque Boulangerie, 460 First St. E., Sonoma. 707.935.7687. Don't let the fact that it's been bought by Boudin keep you away. Artisan Bakers has maintained its stellar quality, cranking out some of the tastiest breads in Sonoma. This is a favorite prewinery picnic stop, featuring creations like the poached pear and blue-cheese sandwich and tomato-basil soup. An all-time favorite is the candied lemon scone--a buttery, creamy scone infused with candied lemon peel. Artisan Bakers, 750 W. Napa St., Sonoma. 707.939.1765. As the lone gringa in this Latino sweet shop, it seemed best to simply point and smile at the case of enormous pastries before me. Churros are just the start. Piled high are Mexican doughnuts, fruit-topped buns, cream-filled rolls and pan fiña, sweet Mexican bread. 827 Petaluma Blvd. N., Petaluma. 707.765.2772. A screen door swings open to a waft of warm, yeasty air. Just past the couple parked on the bench, the bikers java-ing up (Bovine is an espresso-free zone) and the patient dogs parked outside, is a cozy cup of a room, filled with crunchy, wholesome breads and pastries. This is energy food, with lots of sprouted grains and granola, along with just plain loads of butter in the chive and cheese croissants (our favorite). Bovine Bakery, 11315 State Route 1, Pt. Reyes Station. 415.663.9420. From the June 2-8, 2004 issue of the North Bay Bohemian.